The P.A. has decided to punish its own citizens in need of medical treatment, which costs $100 million a year, because it lost $138 million that it pays to terrorists in Israeli prisons and released terrorist prisoners. 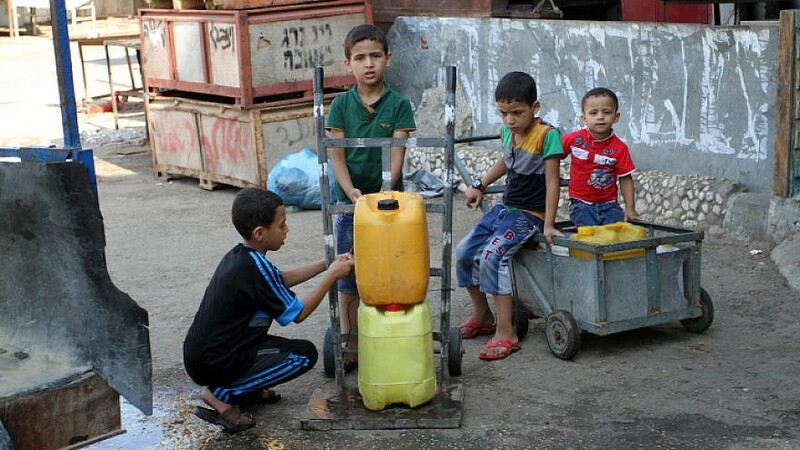 Palestinians fill plastic bottles with drinking water from a public tap in the southern Gaza Strip refugee camp of Rafah, on July 26, 2015. Photo by Abed Rahim Khatib/Flash 90. (April 1, 2019 / Palestinian Media Watch) Until now, Israel has been giving medical treatment in Israel to thousands of Palestinians every year. But this humanitarian program will now come to an end, as the Palestinian Authority has decided to stop sending its citizens in need of medical treatment to Israel. The P.A.’s explanation is as follows: Since Israel is refusing to transfer approximately $138 million to the P.A. this year to spends on salaries to terrorists, the P.A. will no longer permit Palestinians to travel for medical treatment in Israel, for which the P.A. has to pay. In essence, the P.A. has decided to punish its own citizens in need of medical treatment, which costs $100 million a year, because it lost $138 million that it pays to terrorists in Israeli prisons and released terrorist prisoners. Israeli law is explicit that should the P.A. stop paying salaries to terrorists, Israel could release and return all this money to the P.A. In 2015, the last year for which there are public records, more than 102,000 Palestinians were granted permits to enter Israel for treatment, including some 20,000 Palestinians who received medical treatment in Israeli hospitals. Significantly, the current decision is in addition to the P.A. decision to cut the salaries of its civil servants, as a result of the financial crisis the P.A. is inflicting on itself. Seen in their entirety, the decisions of the P.A., stating the implementation of Israel’s anti-“pay for slay” law as the major reason for the changes in policy, clearly demonstrate the P.A.’s priorities: The continued payment of the salaries to the Palestinian terrorist prisoners and released prisoners is more important than providing sick Palestinians with the opportunity to receive medical treatment in Israeli hospitals, or the right of its law-abiding non-terrorist employees to receive their full wages.